Turkish authorities continue to detain the 12 Iranian refugees arrested in Ankara while protesting against the UN Refugee Agency’s violations of the rights of asylum-seekers in Turkey. As a result of their public demand for their rights under international law, the refugees have received indirect threats from the police in Kayseri and Nigde and fear returning to their assigned satellite cities. UNHCR has asked the protesters to leave Ankara. 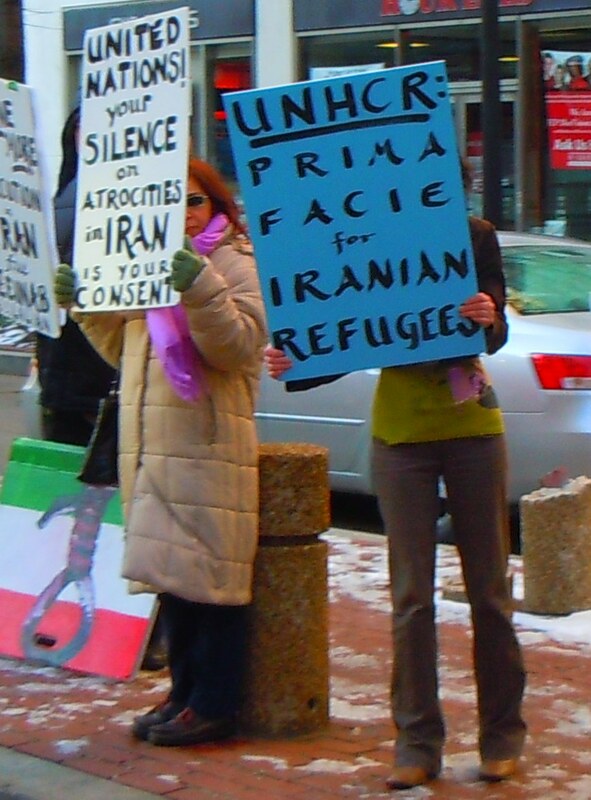 Washington, DC, December 20, 2010 – Turkish authorities continue to detain all 12 Iranian refugees who were arrested by police in Ankara while protesting against the UN Refugee Agency’s violations of the rights of asylum-seekers in Turkey, according to reports from the detainees. Two of the asylum-seekers, Soheila Zaki and Masoud Keyhan, were taken to UNHCR offices to discuss their stated demands but were later returned to prison. According to Ms. Zaki, the spokesperson for the protesting asylum-seekers, they were told by UNHCR that the refugees should return to their satellite cities of Kayseri and Nigde, and that UNHCR would contact them in a period of one week regarding their demands. However, Zaki made it clear to UNHCR staff that the 12 detained protesters carried demands that represented a group of approximately 500 asylum-seekers in their respective cities. She emphasized that if UNHCR and the Turkish government forced them back to their cities, UNHCR would face demonstrations by 500 people. Zaki further stated that addressing the individual cases of the 12 protesters is not an acceptable approach to managing refugees’ demands: UNHCR must answer to the larger demands of refugees as a class, as stated in earlier press releases issued by the International Coalition for the Rights of Iranian Refugees. Those larger demands include recognition of Iranians fleeing persecution in their home country as prima facie refugees, and a systemic redress of the inefficiencies, abuse, and lack of professionalism characteristic of UNHCR in Turkey. The protesting Iranian refugees urge that they be allowed to stay in Ankara to await UNHCR’s response to the demands of the asylum-seekers, both to ensure their safety as well as to ensure they obtain a response from UNHCR in the specified time period. They fear violence from the police in Kayseri and Nigde, who have sent threatening messages to the refugees via their friends, and have issued generalized threats to members of the refugee community who are presumed to be associated with the protesters. We emphasize that, due to the fact that these asylum-seekers have been arrested and detained, and have been indirectly threatened by the police in Kayseri and Nigde as a result of demanding their rights, they have a legitimate fear of persecution by the Turkish state. On this basis, they have a fundamental right to seek immediate asylum in a safe country. The detained Iranians were peacefully airing justified complaints against the UNHCR when they were arrested by the Turkish police on Sunday, 19 December 2010. Those detained include Masoud Keyhan, Mehdi Barar Tabar, Arezou Jalali Asl, Hamid Jalali Asl, Alireza Jamshidi Far, Reza Salmanian, Iman Salmanian, Soheil Sefidroo, Davood Rostami, Soheiyla Zaki, Poorya Saeedloo, and Ali Reza Karimi. Hamid Jalali Asl and Arezou Jalali Asl are both minors, age 16 and 17, respectively. We urge the Turkish authorities to respect the fundamental human rights of these detainees and release them immediately and without condition. If they are not released immediately, we will be obliged, in our responsibility to the refugees, to take legal measures in order to free them. The International Coalition for the Rights of Iranian Refugees will continue to monitor the situation of the detained Iranian asylum seekers closely and inform all concerned individuals and organizations about their status.